Historical Materialism special issue on Giovanni Arrighi out now! Giovanni Arrighi in Beijing: An Alternative to Capitalism? on Steve Ellner’s Rethinking Venezuelan Politics: Class, Conflict and the Chávez Phenomenon; Eva Golinger’s Bush vs. Chávez: Washington’s War on Venezuela; Gregory Wilpert’s Changing Venezuela by Taking Power: The History and Policies of the Chávez Government. Guy Debord’s Correspondence: The Foundation of the Situationist International (June 1957-August 1960); Michele Bernstein’s All the King’s Horses; McKenzie Wark’s 50 Years of Recuperation of the Situationist International. on Pierre Bourdieu‘s The Social Structures of the Economy. on Bill Bowring’s The Degradation of the International Legal Order? The Rehabilitation of Law and the Possibility of Politics. Historical-Critical Dictionary of Marxism: Christopher J. Arthur. The issue available electronically here. This f ascinating study of global trends in the last three centuries details how noncapitalist and capitalist market economies have interacted to influence their societies. … Arrighi explains the reasons that China, now leading Asian market economy, might soon surpass the Western capitalist-market economy by use of his reinterpretation of Adam Smith’s vision, which he has conceptualized as the “Smithian new Asia age model”. In China. argues Arrighi, economic organizations never lost their capacity to reproduce themselves and never lost control of their means of production. The Chinese economy succeeded because it developed a division of labor that in turn increased income and employment. … Arrighi explains China’s actions by reexamining Adam Smith’s writings, arguing first that Smith had always called for a strong state with the ability to eliminate private and state monopolies in favor of a competitive market economy. … Finally, Arrighi remind his readers that friendship and cooperation between China and theUnited States, based on mutual respect, is one of several future options. He hopes to promote a new mind-set that would lead to a Sino-American-led worldwide commonwealth. The complete review appears in the issue 61 of The China Journal. Giovanni Arrighi (1937–2009) was Professor of Sociology at Johns Hopkins University. His books include The Long Twentieth Century, and his work has appeared in many publications, including New Left Review. The Italian scholar of political economy and sociology Giovanni Arrighi, who has died of cancer aged 71, was an outstanding teacher and mentor. He will be best remembered for his trilogy of works analysing global capitalism, The Long Twentieth Century: Money, Power and the Origins of Our Times (1994); Chaos and Governance in the Modern World System (with his wife, Beverly Silver, 1999); and Adam Smith in Beijing: Lineages of the Twenty-first Century (2007). Giovanni had the uncanny ability to extract clear patterns from the swirling complexities of the historical record. He also possessed the scholarly integrity and patience to marshal compelling evidence for his arguments, thereby establishing his reputation as one of the greatest comparative historical sociologists. His unbounded courtesy and generosity towards his colleagues (particularly those with whom he disagreed) and, above all, to his many students, will be missed. History, he was fond of remarking, is never a done deal, any more than the frameworks we devise to understand it. He had, he once told me, only two regrets: that he had not learned to play the piano or to converse in Mandarin. Yet he taught us to think about China in a radically different way and his ability to play exquisitely on the infinite variations in the history of capitalist accumulation will long echo in our ears. Giovanni is survived by Beverly and Andrea, a son by a former marriage. Read David Harvey’s obituary in full. 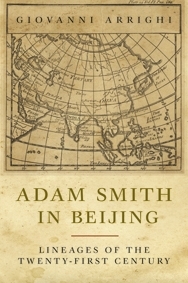 Jeong Seong-jin, professor of economics at Gyeongsang National University, South Korea, reviews Adam Smith in Beijing: Lineages of the Twenty-first Century by Giovanni Arrighi for International Socialism. A memorial site has been set up by Beverly Silver allowing people to share their memories and stories of Giovanni Arrighi. Giovanni Arrighi passed away on Thursday 18th June. He was one of the foremost scholars of the history and future of capitalism, and author of The Long Twentieth Century: Money, Power and the Origins of Our Times and Adam Smith in Beijing: Lineages of the Twenty-First Century. A conference was recently held in his honour in Madrid. Earlier this year David Harvey interviewed Giovanni for New Left Review about his life’s work and it can be read here.